They’ve hung there for over 50 years, and they’ve become so commonplace that they are hardly noticed. 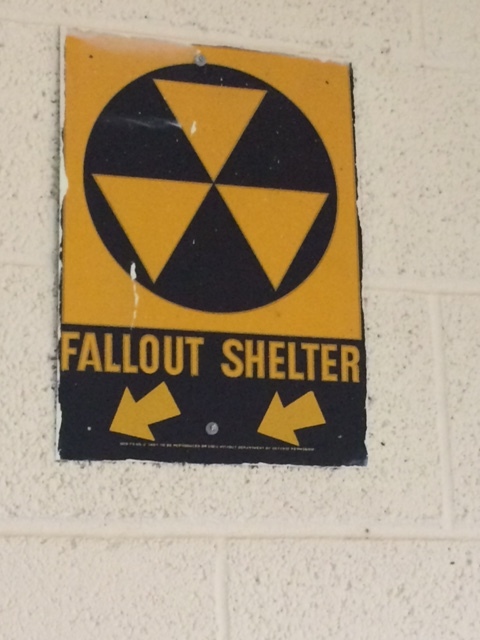 For some reason though, my eyes focused on the FALLOUT SHELTER sign when I entered the church yesterday. During the 50’s and 60’s, shelters of this kind were stocked with crackers, candy and water to sustain people if their fears of a nuclear holocaust became a reality. In some districts, public schools would have practice drills, so the students would know what to do in case of an attack. Whenever I read this Psalm and think of being covered with “his feathers,” I’m reminded of the protective behavior of a pigeon that is sitting on a nest of eggs. My brothers and I raised pigeons when we were kids, and our curious hands were spanked more than once by a hen who was protecting her squabs. God does the same for us: He covers us with His feathers; hides us under His wings; and, He is our refuge, truth, and shield of armor. This is the same God who said He would never leave or forsake you. Be gracious to me, God, be gracious to me, for I take refuge in You. I will seek refuge in the shadow of Your wings until danger passes.